He Who has a splendid bow. The literal meaning is "One who has a splendidbow". The vyAkhyAna kartA-shave different anubhavam-s in interpreting the nAma based on this meaning. SrI BhaTTar gives the instance of the fight that ensued between the deva-s and the asura-s as a result of the distribution of the nectar, and the resulting demonstration of the splendor of His bow in bringing about the end to that conflict. BhagavAn's dhanus symbolizes the senses (the eyes and the rest), and He supports the ego or awareness due to the senses (indriya ahamkAra), represented by the SAr'nga bow in His hand. (The other verses inSrI vishNu purANam continueto describe how bhagavAn is the source and supporter of everything in the Universe as represented by the different Ayudha-s and aspects of His Form, and thus gives one mode or representation of a way of meditating upon Him in the forms that are more easy for the mind to grasp than to meditate on anabstract truth). References in divya prabandham that convey the sense of this nAma are (from SrI v.v. rAmAnujan): tadavarai tOL cakrapANi SAra'nga vil SevaganE! (periAzhvAr 5.4.4), paramETTi, pavittiran, SAr'ngam ennum vil ANDAn (tiruppallANDu). SrI satyadevo vAsishTha gives the analogy of the function of bhagavAn inprotecting the world from the asura-s with His dhanus, just as the bow-shapedeye-brow protects the eye of everyone from unwanted foreign objects. He with the broken axe. Khanu - bhedana = avadhAraNa (khaDi - bhedane- to break), and param SRNAti itiparaSuh Satram, together make the nAma khaNDa paraSuh - One with the broken axe(SrI satyadevo vAsishTha). Alternatively, one can look at it as khaNDayatiSatrUn iti khaNDah, khaNDah paraSuh yasya iti khaNDa paraSuh - He whose axepunishes or destroys the enemies (SrI kRshNa datta bhAradvAj) . SrI BhaTTar quotes the incident involving bhagavAn's fight with rudra, where He discharged the axe which became broken. So bhagavAn saysHe is known as "One with thebroken axe". tato'ham khaNDa-paraSuh tatah paraSu-kahNDanAt || (mahAbhA. "Then for the destruction of rudra, nara took a reed and by the recitation of mantras gave new power to it. At once it became an immense axe. It was thrown on rudra with great force. Butthen it broke. Becauseof the breaking of the axe, from that time I came to be known as "khaNDa paraSuh - the Lord with the broken axe". SrI Samkara interprets the nAma in terms of the paraSurAma incarnation - where, as Jamadagni's son, He punished His foes. Alternatively,SrI Samkara suggeststhat the nAma can be taken as a-khaNDa paraSuh, He who wields an invincible axe - the nAma being given as a-kahaNDA-paraSuh in this case. SrI v.v. rAmAnujan quotes irAmAnuSa nURRantAdi-56 which supports theinterpretation in terms of the paraSurAma incarnation - kOkkula mannaraimUvezhukAl oru kUr mazhuvAl pOkkiya dEvanaip pORRum punitan, in referring tobhagavad rAmAnuja. 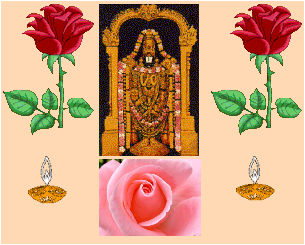 Another reference is to tiruvAimozhi 6.2.10: ninRila'ngu muDiyinAi irupattOr kAl araSu kaLai kaTTa venRi nIr mazhuvA. b) He who is merciless to those who deviate from the path of virtue. SrI BhaTTar's vyAkhyAnam is "bAhyAbhyantara ari dAraNAt dAruNah - As indicated above, He splits into pieces (destroys) the enemies both internal and external. So He is called dAruNah. SrI v.v.rAmAnujan gives reference totiruvAimozhi 9.9.2 - igal iDattu aSurargaL kURRam, and to Siriya tiru maDal 41 - avaTku mUttOnai ven-narakam SerA vagaiyE Silai kunittAn. SrI Samkara vyAkhyAnam is san-mArga virodhinAm dAruNatvAt dAruNah - He who is harsh and merciless towards those who follow the evil path. SrI cinmayAnanda gives a niceexplanation that when He punishes anyone, it is for the ultimate good of the one who is being punished. "Up to a point the Lord is All-Mercy, but when He finds out that noother method can save theindividual, like a surgeon at the operation theater, He appears to be relentless - merciless". The next few nAma-s are being interpreted by SrI BhaTTar in terms of bhagavAn'svyAsa incarnation. "vyAsa holds in his left hand the collection of all the SAstra-s and their purport, and propounds by his right hand (the upadeSa mudrA) the true import of all the SAstra-s". nammAzhvAr calls bhagavAn"paNbuDai vEdamparanda payan" in tiruvAimozhi 6.6.5.
yatkAmAs te juhumas tanno astu vayam syAma patayo rayINAm (yajur. The dharma cakram writer has written his explanation for this nAma in Vol. 45.5of dharma cakram, the beauty of which is lost somewhat in translation. Hedescribes wealth as of two kinds: preyas and Sreyas. Preyas is that which causes priyam or worldly satisfaction. Sreyasis that which gives spiritual satisfaction. To the first category belongthe material wealth, the official position, the wife, the husband, children,etc. preyas gives problems at one stage or the other. Sreyas removes all problems and sufferings, and leads to mokshamultimately. After getting the wealth of Sreyas, there is nothing more toget. Preyas is transient wealth, and Sreyas is permanent wealth. BhagavAn is ever ready to give either of the wealths one seeks, and mostgo after the transient worldly pleasures, and very few seek Sreyas. There is the vedic story of naciketa, who requested the wealth of Sreyas from yama, and yama offered to give him the preyas instead. naciketa told yama that he did not need yama's help for preyas, because he could get that by his own effort; yama's help was needed onlyfor Sreyas, since this is somethingthat cannot be obtained by one's own effortalone. The lesson to take for us is that we should pray to bhagavAn for Sreyas, since this is the wealth that we cannot attain by our own effort and without His Grace. This is the tAtparyam behind this nAma. He Who touches the skies. b) by His being not only in the form of this Universe, but also far beyond it. c) By His vAmana incarnation. d) By His viSva rUpa revealed to arjuna. e) By His being the antaryAmi for sUrya and the other planets. a) SrI BhaTTar interprets the nAma as referring to the unbounded extentof Hisknowledge. By His para vidyA (brAhmic or Supreme knowledge), Hetouches themystic nature of His Reality as it is in the paramapada. SrI v.v.rAmAnujan gives reference to tiruvAimozhi 3.1.9 - mazhu~ngAdaj~nAnamE paDaiyAgatozhumbAyArkkaLittAn. b) It can also mean that He resides in His para form in the regions farbeyondthe skies. The Sruti declares that one-fourth of His form is inthe form ofthis Universe, and three-fourths is beyond the Universe(tripAdsyAmRtam divi -chAndogyopanishad 3.12.6) (SrI rAdhAkRshNaSAstri). c) SrI kRshNa datta bhAradvAj gives the nAma as divah spRk, andexplains that inthe vAmana incarnation, bhagavAn touches the skieswhile measuring the three feetof land that were promised to Him bymahAbali - vAmanAvatAre SrI bhagavAn svacaraNa kamalena vardhamAnenadivam pasparSa. d) SrI cinmayAnanda gives the interpretation that He revealed His Universal formto arjuna as divah spRk. e) SrI satyadevo vAsishTha gives references to the Sruti to interpret theassociation with divi as referring to the sun. divi-spRgyAtyaruNAni kRNvannuto eti pRthivyA reNumasyan || (Rg. He points out that the terms divi-kshayam, divi-kshitA, divi-carAh,divi-jAh,divi-yajah, divi-yonih, divi-Sritah, divishadah, divi-sadam,etc., are usedrepeatedly in the veda-s to refer to the sun. So heinterprets the nAmadivi-spRk as referring to bhagavAn as the antaryAmiof the sun and all the graha-sthat are in the skies. a) He who sees everything - the totality of para tattvam..
b) He who is in the form of knowledge of all forms. a) sarvasya drashTA sarva-drk - He who has realized the totality ofthepara tattvam. The nirukti description is "sarva darSanAtsarva-dRk". sarva-dRk means He who is Omniscient - He who seeseverything, He who is the eyeof all. SrI v.v. rAmAnujan givesreference to tiruvAimozhi 3.10.10 -taLarvinRiyE enRum e~ngum parandatani mudal j~nAnam. b) sarva-dRk can mean "j~nAnam, knowledge". He who is in theform of knowledge of all forms ( P. SamkaranArAyaNan - BhavAn's Publications). c) SrI satyadevo vAsishTha elaborates on His being able to seeeverything, fromanother viewpoint. He points out that bhagavAn hascreated all thedifferent creations that can see in water, in air, inspace, and even indarkness. He has spread Himself in the Universe indiverse forms which areendowed with bodies to suit these differentconditions, and equipped with indirya-swhich make them function wellunder these different circumstances. Ants cansmell from very faraway, there are birds that can hear from a long distanceaway, thecamel can drink water and store it for a long time, etc. c) He whose ornaments (like kaustubha) shine distinctly. SrI BhaTTar gives the interpretation that because bhagavAn divided theveda thatwas originally in a single form into its four divisions (Rg,yajus, sAma, andatharva), He has the name vyAsa - vibhajanstu caturdhAvai vedamekam trikAlavititi vyAsah. This was done by bhagavAn in Hisincarnation as vyAsa just tomake it easier for people whose knowledgediminishes in accordance with thechanges of the four yuga-s.
SrI Samkara gives the interpretation in terms of the division of theveda-s,and also refers to the division of the purANa-s - anyAni capurANAni vyastAnianena iti vyAsah. SrI satyadevo vAsishTha gives the derviation "vyasyante - pRthakkriyanteanena iti vyAsah - He by whom things are separated or dividedis vyAsa. He then suggests that the nAma can be interpreted based bhagavAn being the Onewho separates day from night, dakshiNAyana fromuttarAyaNa, Sukla paksha fromkRshNa paksha etc. He also separatessUrya from candra, and for that mattermakes this world function by itsvarious divisions. SrI kRshNa datta bhAradvAj gives yet another dimension to theinterpretation - (yasyakaustubhAdIni AbharaNAni viSeshena asantidIpyanti sa vyAsah) - He whoseornaments like the kaustubha shinedistinctively is known as vyAsah. SrI Samkara and the others who follow his vyAkhyAna have interpretedthe abovetwo nAma-s together as one nAma - sarva-dRk vyAsah. It cansimply mean"The omniscient vyAsa". SrI cinmayAnanda has given perhapsthebest interpretation for the single nAma- He who creates manyomniscient men ofwisdom. One who encourages the spread of knowledgeand thus turns out many men ofwisdom and clearer understanding of lifeand the world. This nAma has occurred earlier as nAma 218. Please refer to Slokam 23forthe interpretation provided therein. SrI BhaTTar interpretsthecurrent occurrence as referring to vyAsa's authorship of themahAbhArata - Heis the Master of words which are in the form of thefifth veda - i.e.,mahAbhArata. SrI v.v. rAmAnujan gives reference totiruvAimozhi 5.6.8 -"uraikkinRa munivarum yAnE". SrI Samkara interprets the nAma as "vAco vidyAyAh patih vAcaspatih"-The Master of all learning. He interprets this nAma along withthenext one together as one nAma - vAcaspatir-ayonijah - He who is theMaster ofall learning, and who is not born in a mother's womb. SrI rAdhAkRshNa Sastri comments that one who has mastered the wordsalso does notwaste words, and is precise. This certainly applies tobhagavAn giving usall the instructions for all aspects of lifeconcisely in the form of the veda-s,the brahma sUtra-s etc. SrI cinmayAnanda gives the interpretation that the nAma means "One whoiseloquent in championing the Supreme Law of life". It almost seemslikehe had gItAcAryan in his mind. Some people have interpreted the term vAcah to refer to sarasvati, andthusconclude that vAcaspatih refers to brahma, the pati of sarasvati. BhagavAn beingthe antaryAmi of brahma will justify thisinterpretation. SrI satyadevo vAsishTha observes that bhagavAn created the sun, and wecan easilyperceive that the sun was not born like the normal humans,and so it is easy toperceive that bhagavAn is a-yonijah. SrI Samkara and others following his interpretation have interpretedthe abovetwo nAma-s as one nAma - vAcaspatir-ayonijah - He who is theMaster of words andwho is unborn.